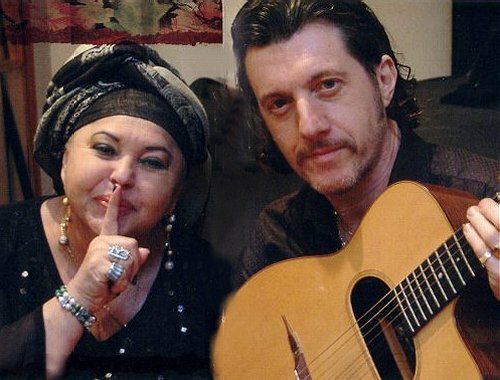 Macedonian Romani musician and humanitarian Esma Redzepova is seen here with French gypsy guitarist Titi Robin. The photo comes from the 2007 Accords Croisés album Esma - My Story which combines new recordings and archive tracks in an invaluable musical portrait of the Balkan 'queen of the gypsies'. Born in 1943 in Skopje, Yugoslavia Esma Redzepova Teodosievska has combined a very successful musical career with extensive humanitarian work and has twice been nominated for the Nobel Peace Prize. Most Roma have converted to the religions of the countries in which they now live, but their formal religious affiliation is often supplemented by traditional Roma beliefs. When the Roma arrived in Europe in the 15th century they brought with them the tradition of worshipping the Goddess Kali and this still finds expression in the annual gypsy pilgrimage to Les Saintes Maries de la Mer in France. Titi Robin's unique brand of syncretic music develops this theme in his concept album Kali Sultana (Black Kali). In Hindu mysticism Kali Yuga is the fourth stage of the human cycle (Manvantara) and is characterized by a remoteness from the principle and source of positive human development and a proximity to darkness. This concept was expanded on by René Guénon's in his book The Crisis of the Modern World which has influenced John Tavener among others. Louis Pauwels and Jacques Bergier treatise on the occult and cosmic interconnectedness is titled, as is this post, The Morning of the Magicians. There are similarities between the traditional Roma beliefs and modern neopagan religious movements such as Wicca which has links with the Hermetic Order of the Golden Dawn on the fringes of which a number of notable figures including Edward Elgar moved. Wicca and its variants have attracted many musicians from The Incredible String Band to Arnold Bax. Rutland Boughton was a leading exponent of musical neopaganism and his opera The Immortal Hour, written for the first Glastonbury Festival in 1914, is a veritable musical morning of the magicians. Below is my 1983 LP set and that Hyperion recording lives on in the catalogue as a budget double CD. 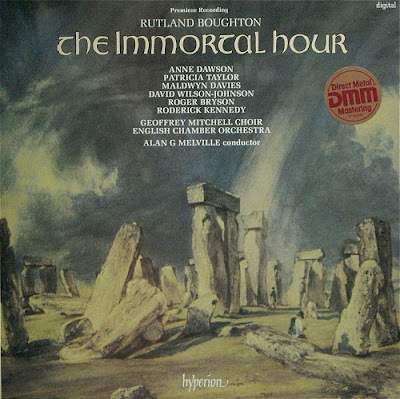 The Immortal Hour predates the play The Starlight Express, with its incidental music by Elgar, by just one year and both were expressions of the then fashionable artistic neopaganism. More in Elgar and the Occult. * Esma Redzepova is one of the musicians featured in the film Gypsy Caravan: Where the Road Bends which follows five gypsy bands on a North American tour in a celebration of Romani culture.